Foreign investment in real estate in Mexico is on the rise and land continues to be a significant part of real estate sales in Mexico... particularly Baja Sur and the Los Cabos region. Navigating the market requires a thorough understanding of buying and selling land in Mexico. Getting the right price - whether you're buying land or selling it – is a matter of knowing the current market. At Baja International Realty, we have both. We'd like to help you find it in the right place at the right price. Baja International has decades of experience as a buyer's agent for individuals seeking to invest in land in Los Cabos, clients who want to build their own homes or ranches, businesses looking for new retail or wholesale locations and developers ready to begin new projects like hotels, residential communities and commercial or office complexes. Let us help you locate the perfect property to fit your real estate needs. SELLING LAND BUT NEED HELP? If you're looking for professional real estate sales help, Baja International agents pride themselves on knowing the market better than any other real estate agency in Los Cabos. We're constantly researching the land market in Cabo to stay on top of market trends, to better forecast future growth paths and to best serve our clients looking to sell. We offer free land value estimates so take a moment to contact us about land values in Cabo San Lucas and southern Baja and we'll be in touch to appraise your property. Just remember to give us as much information about your Cabo land as possible for the most accurate valuation. ON ROAD TO GRAND SOLMAR! PRIME development land! Located on the NEW Rancho San Lucas-Grand Solmar 30 meter wide entrance road. All new utilities being installed now along the newly cut road with paving work already underway. Grand Solmar is set for a December, 2017 opening so work is being done at a rapid pace and land values in the area are going up quickly. The two road-adjacent lots, 10A and 10B, are in fact contiguous with the road splitting the two parcels. Purchase one or both. Direct access to HWY 19. Up to 6 access roads from the new road are included. 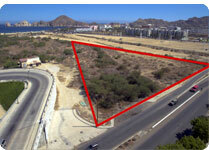 Lot 10A measures 50,324 M2 (roughly 12 acres) and is priced at $2,516,240 USD. Lot 10B measures 111,508 M2 (roughly 27 acres) and is priced at $5,575,427 USD. Purchase both for $8,091,667 USD. For more information on these prime development sites, or the option to purchase the entire property, email Don Weis. 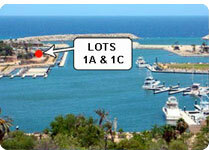 Contact us for more info about this prime developer parcel in Cabo San Lucas. The new Puerto Los Cabos marina has set the stage for a plethora of developments making commercial property on the marina a potential gold mine! We have two combined lots with marina frontage available for immediate sale with a listed price of $589,000 USD. 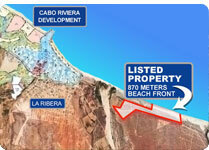 94 acres of prime beachfront land ready for development in the La Ribera area of East Cape, Baja. Property features 870 meters of white sand beach 45 minutes north of the Los Cabos International airport. Located 2 miles from the Cabo Riviera development currently under construction with marina, golf and residences and hotels. Large parcel of land already approved for hotel or resort just north of the Diamante Golf Course that's been dubbed 2010's Best New International Golf Course by Golf Magazine. 152 acres and nearly a mile of beach make up this coastal property with the potential for 3 resorts and more! Over fifty acres of pristine coastal property boasting over a 1/4 mile of sandy beach with an approved Federal Beach Concession, a high output water well and two-sided highway frontage. The property features a towering rock promontory with uninterrupted coastal views to the north and south. Split by Hwy 19, this parcel has exceptional visibility that will only increase when the widening of the highway from 2 to 4 lanes is completed in the next few months. Ripe for development, it has the potential to include an ocean view restaurant and bar, beach club and a mix of single-family residences and condominiums or a hotel project. To arrange a private showing, or to get more information about Rancho Gaspareno, contact us via email or call: 1 925 465-5373 from the U.S. or Canada or 624 143-5555 from within Los Cabos, 011 52 1 624 129-6245 if calling internationally from outside the U.S. or Canada. If you're a developer or investor looking at making a move into the land market in the Los Cabos region of Baja, a copy of the official Los Cabos Master Plan is a must. The map features specific details of the proposed development of Los Cabos real estate including: planned roads and highways; designated residential areas including low and high-density developments; commercial and industrial zones; and where the path of development is headed. A useful tool for any developer, builder or real estate investor – contact us to request a copy of the Los Cabos Master Plan for your library.